The American people FAIL to REFUDIATE VIRAL and EPIC A-HA MOMENTs when we FACEBOOK and GOOGLE the BACK STORY of our BFFs for the WOW FACTOR. Just MAN UP MAMA GRIZZLIES. LIVE LIFE TO THE FULLEST. I'M JUST SAYIN'!! We just wanted to make sure you were paying attention. Buzz word overload? Have no fear, if you think these words are overused and abused, you are not alone. 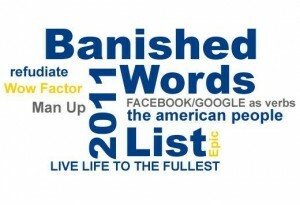 Today, we are highlighting Lake Superior State University's 2011 List of Banished Words. Some of the top choices for banished words were "epic", "viral", and "fail". Improve the way you communicate and give us all a break by checking out the list here. What are your top choices for words that should be blacklisted? My #1 pet peeve is the improper use of the word "like" in conversation and I'm starting to see it in writing. Is Your Communications Plan Hitting The Target?